TNPSC (Tamilnadu public service commission) exam is one of the government examination in Tamil Nadu, and they have given short notice about this exams date, It was announced on 31st December 2018. The application form will be available online on 3rd January 2019 (03/01/19), The last day of application submission is 31st January 2019 ( 31/01/19). 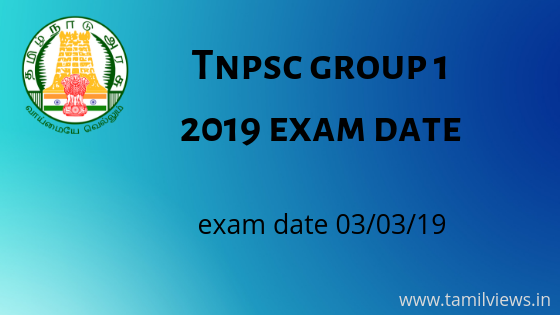 The tnspc group 1 2019 exam date is 03/03/19. Still, now, the Tamilnadu government has not given any details about age limited, qualifications, exam scheme,and payment fees. But they will be announced qualifications details on 03/01/19 in their official website www.tnpscexams.in. Examiners have more time to study for their tnpsc examinations. You can also download this exam and job pdf file in download. Thank you share to all your friends that would be more helpful for his life ☺.